(38x35) Modern Mens Disco Pants! Red, Off-White & Black Argyle! 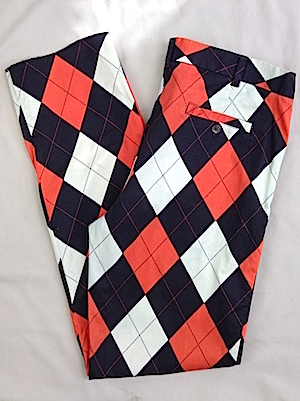 Home > Items just added 4/3-4/17 > (38x35) Modern Mens Disco Pants! Red, Off-White & Black Argyle! Mens modern disco pants! 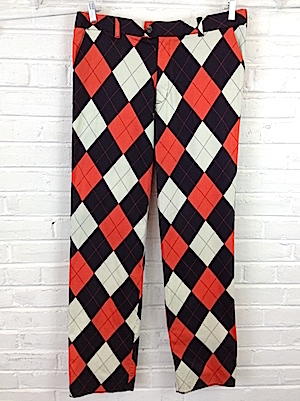 Red, off-white and black argyle print pants. 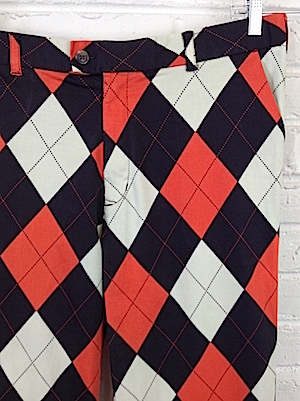 These pants are not vintage, but have a very vintage feel to them. Has extra long belt loops. Closes in the front with an extended tab closure that is secured with marbled tan colored button. Has another button closure on the interior of the pants above the zipper. Two classic pockets in the front with two interior pockets in the back one, both with a button closure. Tagged by Loud Mouth. No material tag, but feels like a cotton and polyester blend.